The quiz games are becoming more popular in nowadays. The main intention of this game is to use the fastest finger fast indicator to test the reaction of the contestants. The team, which press the push button switch first they can answer the query. When the two or more teams are pressed the push button switch within a small gap of time it is difficult to find the team how pressed the push button first. In these cases, the decision is based on the human intervention. The system here is to take care of the previous problems. The fastest finger first system using raspberry pi is used for the maximum of four teams. This system is built on a solid-state relay model and raspberry model. The raspberry is a credit card-sized computer, it is generally designed for the educational purpose to improve the teaching levels of basic computers since in schools and in developing countries. The raspberry pi was developed in the United Kingdom by the raspberry foundation. The raspberry pi is slower than the laptop and desktop, but it is still Linux computer and it can provide low power consumption level, all the excepted abilities. The basic image of the raspberry pi is shown in the following. 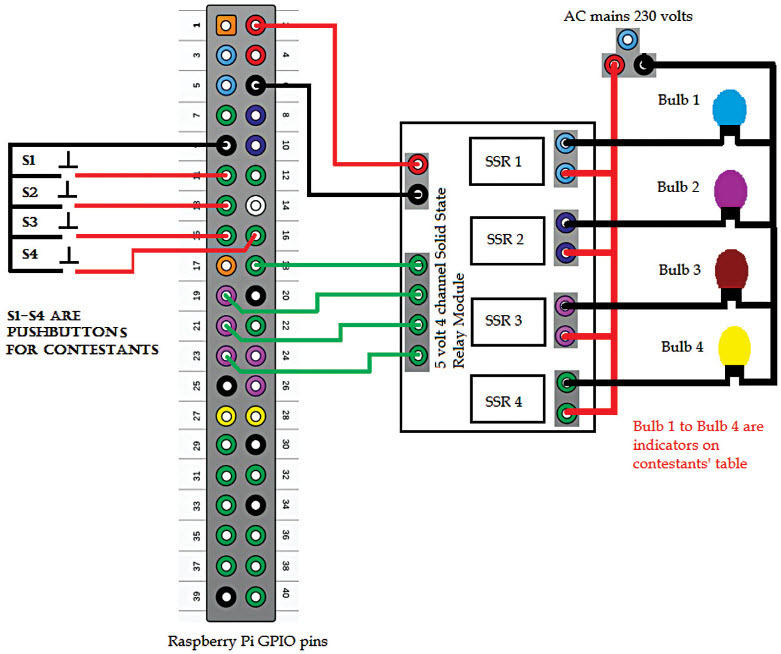 The following circuit diagram shows the fastest finger fast test using a raspberry pi. The raspberry pi works under standard lesbian distortion with the help of the installed GPIO library, Wi-Fi dongle, and the software should be in the python. Most of the coding is used by the raspberry pi. In this circuit, we have provided the indicator bulbs which are near the contestant’s desk to know the person who pressed the push button. The high definition multimedia interface is connected to the LCD monitor to identify the persons who pressed a push button sequentially. This circuit can also control through the SSH (series server host) connections are by VX connectBot software by smart mobile phones. From the play store download connectBot software in the android mobile phone, start the hotspot in the smartphone and connect to the raspberry pi through a Wi-Fi network. Then start the VX connectBot software and login to raspberry pi through the series server host connecting pi and a default password. The terminal window is opened on the Android smartphone from there you can run the python script. The input push buttons switches are from S1 to S4 are wired such that when the button is pressed and the another end is connected to ground pin 9. The input pins are initially at 3.3V by the optional argument. Hence, when you read the input value by using GPIO. input then the false will be returned when the button is pressed. Each GPIO pin has software configurable of the pull-up and pull-down resistors. The event detected function () is designed should be used in the loop through other things, however, unlike polling doesn’t miss the state change of an input when the CPU is working on other things. This is practically used in the quiz games, which are held in the school contestant and college contestant. Hence there is a main loop listening and responding to the GUI events on a timely basis. The SSR stands for solid state relay and it is an electronic switching device which switches ON/OFF when the small amount of external voltage is applied to the control terminal. An SSR has a sensor that will respond to a control signal, the solid state electronic switching device switches the power to a load circuitry and coupling mechanism is used to enable the control signal to activate this switch without using any mechanical part. The relay may be calculated as a switch either AC or DC to the load. The relay has the same functions as an electromechanical relay and there are no parts to move. The code has been written in the python language to detect the push button switch and they are connected to the bulbs to glow. It identifies the fastest finger first contestant in sequential order and the system will be reset. The anchor can identify the first person easily. This article is about the fastest finger first system using a raspberry pi. I hope by reading this article you have obtained some basic knowledge about the fastest finger first system. If you have any queries about this article or about the microcontroller projects in engineering please comment in the below section. 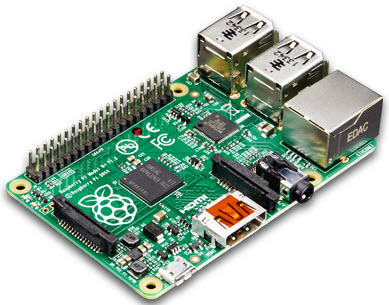 Here is the question for you What kind of operating system is used in the raspberry pi?